After getting ridiculously nerdy with a clue hidden in code, the strategic marketing team behind Boards of Canada have shared their latest, longest clip yet via an easier to understand television commercial. Taking a page from the Daft Punk playbook, the electronic duo shared a 90-second clip on Cartoon Network's Adult Swim block of programming last night (April 27). The clip includes much more atmospheric sound than usual before playing the usual synth line and sharing the robotic number clip. This one's also full of fascinating visuals as shots of a dusty, barren desert and some abandoned buildings fill up the lengthy clip. The number in this one is 699742, the same as what was shared on NPR. Back then, it was unclear where to place the number in the sequence, but this clip reveals that it goes at the start. That means the chain of numbers currently looks like this: "699742 / 628315 / 717228 / 936557 / —— / 519225." We're only one empty slot away from finding out whatever they're trying to tell us. Like maybe that the album is called Cosecha. Or that they're going to enslave the human race and end civilization as we know it. 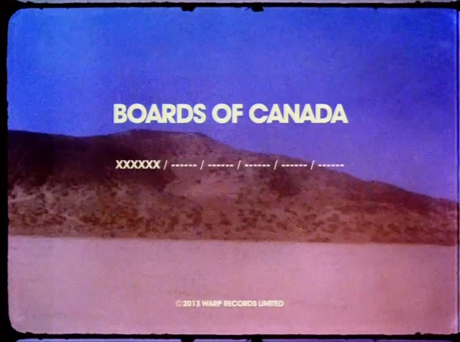 Check out the latest Boards of Canada video below.